Laurasia is the name given to the largely northern supercontinent that is thought to have formed most recently during the late Mesozoic era, as part of the split of the Pangaean supercontinent. It also is believed that the same continents comprising Laurasia existed as a coherent landmass much earlier, forming after the breakup of the hypothesized supercontinent Rodinia about 1 billion years ago. The landmass of this earlier period is sometimes referred to as Proto-Laurasia to avoid confusion with the Mesozoic supercontinent. The name Laurasia combines the names of Laurentia and Eurasia. Laurasia included most of the landmasses that make up today's continents of the northern hemisphere, chiefly Laurentia (the name given to the North American craton), as well as Baltica, Siberia, Kazakhstania, and the North China and East China cratons. The formation of different supercontinents, such as Laurasia, is explained today by the theory of plate tectonics, which recognizes the earth to have a thin, solid crust, made up of several plates, that floats or rides on an inner layer of melted rock. The view of a supercontinent that is hundreds of millions of years old poses a problem for young-earth creationists, but plate tectonics is widely accepted today and backed by considerable scientific evidence. In geology, a supercontinent is a landmass comprising more than one continental core, or craton. Supercontinents are considered to form in cycles, coming together and breaking apart again through plate tectonics. The theory of plate tectonics encompassed and superseded the older theory of continental drift from the first half of the twentieth century and the concept of sea floor spreading developed during the 1960s. The breakup of Pangaea some 250 million years ago lead to the continents we presently know: Africa, Antarctic, the Americas, Asia, Australia, and Europe. It is considered that 250 million years from now, the present-day continents will once again reform into one gigantic supercontinent (Nield 2007). The continents comprising the supercontinent Laurasia are believed to have formed this landmass on two separate occasions, although the earlier version is often known as "Proto-Laurasia" to distinguish it. Proto-Laurasia is believed to have existed as a coherent supercontinent after the breakup of the hypothesized supercontinent Rodinia around 1 billion years ago. Rodinia, believed to have formed 1.1 billion years ago during the Proterozoic, was the supercontinent from which all subsequent continents, sub or super, derived. Proto-Laurasia may have split off about 750 million years ago. It is believed that it did not break up again before it recombined with the southern continents to form the late Precambrian supercontinent of Pannotia, which remained until the early Cambrian. Laurasia was assembled, then broken up, due to the actions of plate tectonics, continental drift and seafloor spreading. The most recent version of Laurasia existed during the Mesozoic, and formed from the breakup of the supercontinent Pangaea (or Pangea). Pangaea existed during the Paleozoic and Mesozoic eras, before the process of plate tectonics separated each of the component continents into their current configuration. Pangaea broke apart during the Triassic and Jurassic periods of the Mesozoic, separating first into the two supercontinents of Gondwana (or Gondwanaland) to the south and Laurasia to the north, and thereafter into the continents as they are observed today. One simplified version for Laurasia's origin holds that Laurasia itself was formed by the collision of the Siberia continent and the minor supercontinent Laurussia (or Euramerica). After these three major landmasses collided, other smaller landmasses collided as well. During the Cambrian, Laurasia was largely located in equatorial latitudes and began to break up, with North China and Siberia drifting into latitudes further north than those occupied by continents during the previous 500 million years. By the Devonian, North China was located near the Arctic Circle and it remained the northernmost land in the world during the Carboniferous Ice Age between 300 and 280 million years ago. There is no evidence, though, for any large scale Carboniferous glaciation of the northern continents. This cold period saw the re-joining of Laurentia and Baltica with the formation of the Appalachian Mountains and the vast coal deposits, which are today a mainstay of the economy of such regions as West Virginia, the United Kingdom, and Germany. Siberia moved southwards and joined with Kazakhstania, a small continental region believed today to have been created during the Silurian by extensive volcanism. When these two continents joined together, Laurasia was nearly reformed, and by the beginning of the Triassic, the East China craton had rejoined the redeveloping Laurasia as it collided with Gondwana to form Pangaea. North China became, as it drifted southwards from near-Arctic latitudes, the last continent to join with Pangaea. Around 200 million years ago, Pangaea started to break up. Between eastern North America and northwest Africa, a new ocean formed—the Atlantic Ocean, even though Greenland (attached to North America) and Europe were still joined together. The separation of Europe and Greenland occurred around 60 million years ago (in the Paleocene). 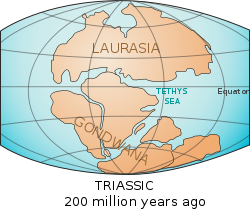 Laurasia finally divided into the continents after which it is named: Laurentia (now North America) and Eurasia (excluding India and Arabia). Nield, T. 2007. Supercontinent: Ten Billion Years in the Life of Our Planet. Cambridge, MA: Harvard University Press. ISBN 0674026594. Parrish, J. T. 1993. Climate of the supercontinent Pangea. Journal of Geology 101:215-233. Parrish, J. T., M. T. Bradshaw, A. T. Brakel, S. Mulholland, J. M. Totterdell, and A. N. Yeates. 1996. Paleoclimatology of Australia during the Pangaean interval. Palaeoclimates, Data and Modelling 1:241-281. Torsvik, T. H. 2003. The Rodina Jigsaw Puzzle. Science 300(5624): 1379-1381. United States Geological Survey (USGS). 2009. Historical perspective. USGS (January 13, 2009). Retrieved June 3, 2009. This page was last modified on 10 July 2009, at 17:18.